The Faculty of Engineering includes Center for Liberal Arts and Sciences and six departments: Mechanical Systems Engineering, Intelligent Robotics, Electrical and Computer Engineering, Environmental and Civil Engineering, Biotechnology, and Pharmaceutical Engineering. Faculty members conduct research across a wide variety of fields, maintaining close relations among the six departments, and with outside organizations. Center for Liberal Arts and Sciences consist of five research areas: Humanities, Social Science, Sciences, Foreign Languages, and Health Science. 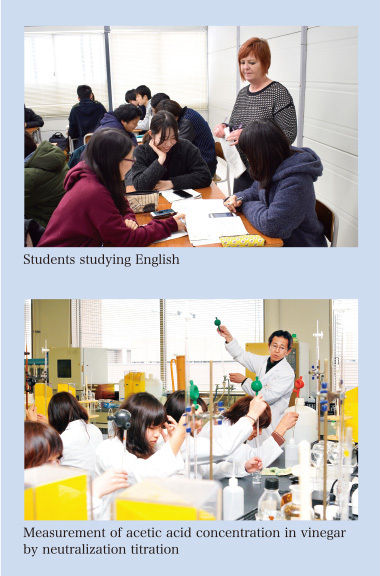 Japanese literature, Japanese expression, Art history and theory of arts, Philosophy, History of science, Economics, Sociology, Psychology, International relations, Law, English, German, Chinese, Mathematics, Physics, Chemistry, Biology, Theory of health and exercise sciences, First year seminar. Social interaction and 'cognition,' Modern German literature, Linguistics (syntax, morphology, speech science), Chinese, English, German. The Department of Mechanical Systems Engineering offers four courses of study: Thermal and Fluid Engineering, Solid Mechanics, Design and Production Engineering, Materials Design and Processing. Each course provides students with basic engineering classes and advanced engineering classes by method of lectures, practical exercises, and experiments. The Department of Intelligent Robotics offers an interdisciplinary program where students may learn fundamentals of mechanical engineering, electronics and informatics. Our program enables students to acquire comprehensive knowledge and skills to challenge in designing advanced control system, smart sensing system, intelligent human interface or new functional devices, which are indispensable to enveloping an intelligent robot. Working towards the achievement of "advanced human-friendly electrical and information systems," we are developing highly talented engineers and researchers who can flexibly manage diverse and rapid social changes. For this purpose, we offer basic and professional education in the field of electrical and computer engineering. 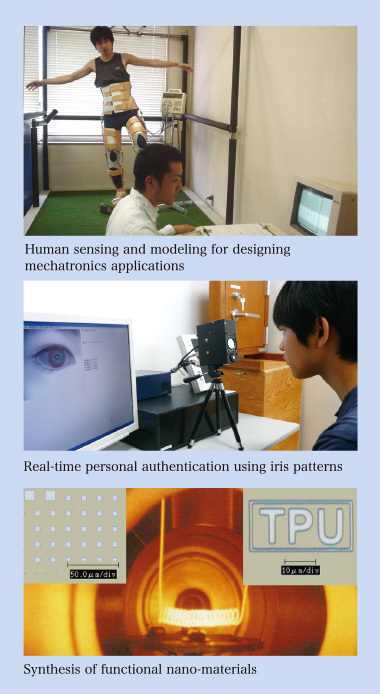 Processing of enormous data gathered from multiple sensors, terminals, devices, etc. The department consists of two related courses: “Environmental Engineering” and “Civil Engineering.” The former focuses on the creation of a resource recycling society and the protection of a clean, safe environment for sustainable development. The latter course focuses on effective natural disaster management and efficient infrastructure and energy management to construct safe, sustainable, and resilient societies. Our faculty and staff are dedicated to educating our students to ensure that they have the necessary creative and practical skills to solve various environmental issues and create a safe and sustainable future. The Department of Biotechnology offers seven courses of study. The faculty is responsible for education of advanced subjects covering the following themes under each course of study. Microbiology; Biochemistry; Enzymology; Organic chemistry; Molecular biology; Molecular genetics; Gene engineering; Protein engineering; Improvement of enzyme functions based on its 3D structure; High-throughput screening of enzymes; Enzyme chip technology; Enzymatic synthesis of chiral intermediates; Biotransformation of synthetic chemicals. Biocatalysis; Enzyme engineering; Molecular genetics; Protein engineering; Biological chemistry; Applied microbiology. Chemistry and Functionality of Polyglycerols; Chemistry of Woody Biomass and Lignin; Development of Novel Synthetic Methodology; Total Synthesis of Biologically Active Natural Products. Molecular biochemistry of functional foods; Metabolism of biofactors including physiological and dietary compounds; Enzyme chemistry of xenobiotic metabolizing enzymes; Molecular genetics. Biochemistry; Enzymology; Bioorganic Chemistry; Plant cell and tissue culture; Genetic engineering; Molecular breeding; Natural product biosynthesis; Secondary metabolism and its regulation; Biomass utilization. Microbioinformatics; Genome engineering; Genome evolution; Cell engineering; Cell evolution; Systems biology. 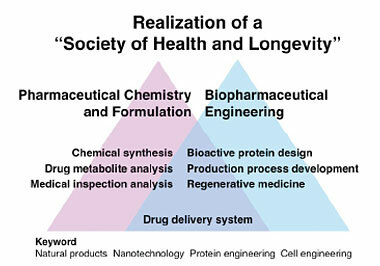 Pharmaceutical engineering is a developing field focused on the discovery and manufacture of drug medicine. It is expected to complement other scientific fields already engaged in drug development, and assist in solving contemporary problems related to medicine and healthcare by producing quality products from the perspective of engineering. The aim of the faculty is to turn out highly qualified engineers who are well-grounded in science and technology to work in the pharmaceutical industry with creativity and capability. We train individuals who can create and develop new pharmaceutical technology and support future industry based on the traditions of Toyama's medicine. 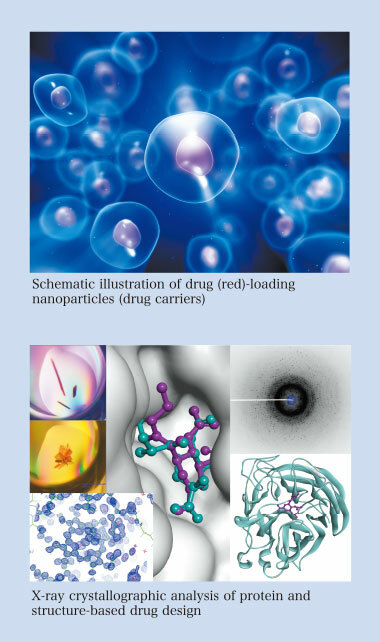 Education and research in this course focus on small drug development, which involves how small drugs are chemically synthesized in simple and effective processes, how drug formulations are designed to maximize their efficacy in the body, and how final products are inspected and packaged with cutting-edge technologies. Key words: organic chemistry, process chemistry, fine chemistry, analytical chemistry, advanced lithography, functional materials, chemical engineering, powder engineering, drug delivery system. This course fosters qualified persons with the knowledge and skills needed to apply engineering principles to the pharmaceutical industry by use of biological systems including materials from molecules to a cell. These systems are based on recent advancements in scientific fields described by the following key words. Key words: biochemistry, genetic engineering, drug metabolism, cell engineering, protein chemistry, protein engineering, bioinformatics, biophysics, protein design, structure-based drug design, antibody engineering, drug discovery, pharmacology, regenerative medicine.